Hi there, crafty friends! I'm back, yay! So happy to be here. Last month I was so busy, my husband had knee replacement surgery and between hospital and rehab it took over half of the month, then Christmas, and there was no time for me to blog. Besides, I'm a slow crafter... but I did manage to send all the Christmas cards on time, some birthdays cards (not so on time) and of course visit many blogs. I wanted to play with some challenges, so today I made several cards. I'm sharing two today, for a couple from our Church, both have birthdays just few days apart. 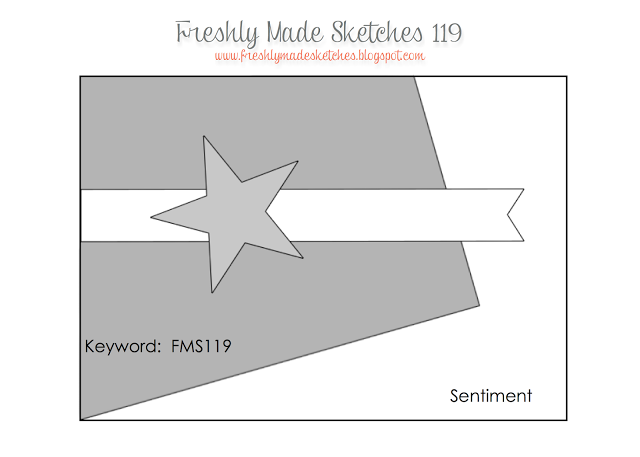 I used the sketch at Freshly Made Sketches # 119 (which I just realized, it's closed to link), but I'm sure I'll be using it again as I like it so much. The change in the sketch was my mistake when I adhered the panel, but I liked it so, I went with it. The cardbase cardstock is Bazzil, the light blue is a Christmas paper by American Crafts and the red stripes is the border of the same paper. (I love when I can use everything). The stamp is Simon Says Stamps that came with the November kit. Thanks for your visit! Have a blessed week. awesome cards Loly! Good for you for going with what works! Both of your cards are fabulous. So glad to see you back! I have been busy and out of town too, it just doesn't make blogging easier, does it? Your cards are so lovely. I, too, found your mistake to be a happy accident- I like that card best. However, the pink card is lovely to and they will both feel very special to receive something so lovely. Welcome back, Loly! Hope hubby has recovered well & feels like a new person with his new knee! Your cards are great--both versions of the sketch! Yay, great to see you back, Loly!! Hope your husband is back to normal now. I know that had to be very taxing on you as well. Wonderful cards too. Love how you made two different versions! What a fun card!!! Fabulous! !